A true golf vacation. That's paradise. That's Iberostar Playa Paraiso Golf Club! The best golf in the world is concentrated in the Riviera Maya. 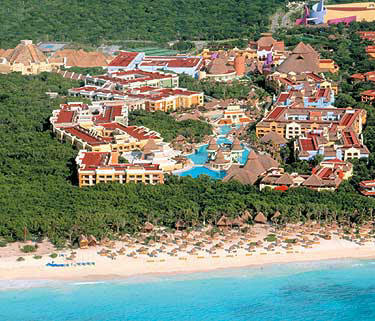 The Iberostar Playa Paraiso Golf Club is just 30 minutes from Cancun International Airport . This 18 holes, par 72 golf course was designed by P.B. Dye, including to it the native Mayan jungle and unexpected changes to the terrain. 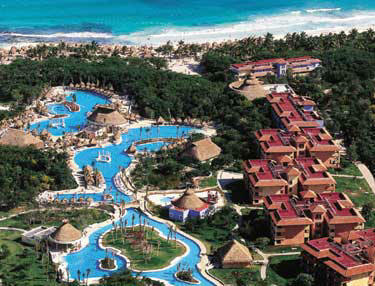 The extreme beauty of the area occupied by the Iberostar Playa Paraiso Golf Club inspired P.B. Dye for his latest creation. This golf course, with its endless costs, 6800 yards and an unsurpassed design, is among the best golf courses in the world. Narrow fairways, undulating greens and deep sand traps will challenge you in a dynamic game from start to end. Get ready before getting into the game, by practicing your swings in the lit driving range or in the convenient putting green. You will find showers and lockers for men and women, as well as an equipped golf shop at the club house. The Pro-Shop offers the best quality golf products with an unparalleled service. Here you will find footware, wooden and iron clubs for rent from the most renowned brands, such as Titleist, Nike and Mizuno. 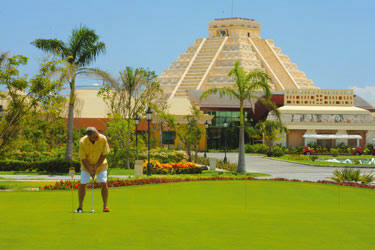 One of the innovations of Iberostar Playa Paraiso Golf Club is the All Inclusive service provided to the golfers. You can forget about the extra charges for food and drinks; they can be served at the Club House or delivered to the green while you are playing the best game of your life. 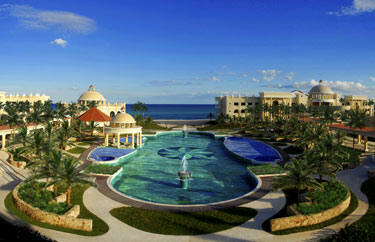 - Sample the finest Mexico and the Caribbean have to offer by staying at an Iberostar Resort. These luxurious all-inclusive resorts, set against a backdrop of beautiful beaches and swaying palm trees, are a vacationers dream come true. Experience it all with Iberostar Resorts! BOOK NOW AND SEE WHY IBEROSTAR HOTELS HAVE THE #1 REPEAT GUEST RATE OF ALL CANCUN & RIVIERA MAYA HOTELS! From the spectacular white-sand beach to the exemplary service, this premiere adults-only resort provides the perfect setting for sensational Mexican getaways. Inspired suites boast splendid views of the Caribbean while the premiere dining, opulent spa, 18-hole golf course and nightly entertainment ensure unforgettable stays for each and every guest. Nestled amidst lush gardens and turquoise waters, this picturesque resort's quaint buildings are designed to replicate an authentic Mexican village. Blending attentive hospitality and unique amenities like the wave pool and fondue restaurant, this inspired haven creates the feel of a small retreat with the amenities and luxuries of a big resort that's perfect for couples and families. 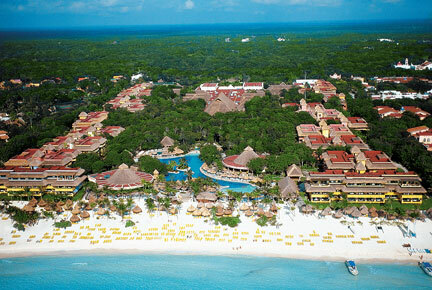 This unique Iberostar all-inclusive Mexico hotel offers 350 rooms in individual Bungalow style buildings. Keeping in perfect harmony with the ecology and environment, each Bungalow is surrounded by 28 acres of lush and exuberant tropical gardens. The pools encompass 2 acres of water, featuring one standard free flowing pool with a center island covered with palm trees and jacuzzi, one activities pool, quiet pool for adults only, and kiddie pool.